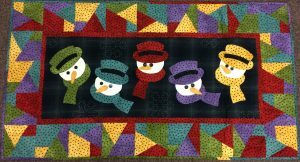 The Dog Days of Summer have arrived but we’re not dogging it at Thimbles…..for those of you that purchased the scrap crazy template or would like to purchase the template and make a project now here’s the class we’ll be doing There’s still room so contact the shop to sign up. It’s fun, simple and quick and you’ll be ready when the snow begins to fly… months from now. Salvages are fun and we had a class planned for this Saturday, but many are into summer events and couldn’t make it so we’ll reschedule at a time more are available. Let me know if you’re interested and what dates work best for you. 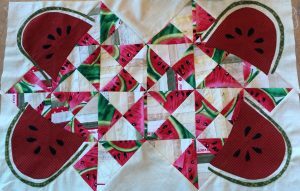 I made lemonade last week and watermelon’s this week Just adding the binding now. If you don’t have enough salvages, don’t worry I have a tote full and love to share. Coat a 9×13 pan, layered with chopped cauliflower, thinly sliced zucchini, chopped red/yellow pepper, sliced tomatoes and topped with 1/2 cup panko & 1/4 cup grated parmesan. Bake at 400 for 30 min (topping is golden brown) and then covered with foil and continued to bake for 10 minutes. Delish. 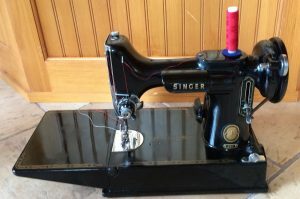 For anyone looking for a sweet Singer Featherweight, I have a dandy. Stop in and take a look. She’s been cleaned and runs so quiet. Enjoy the week. Stop in when you’re passing by.